Thank you for your support during this difficult time. Please enhance this tribute to Donald by adding your memories and photos. 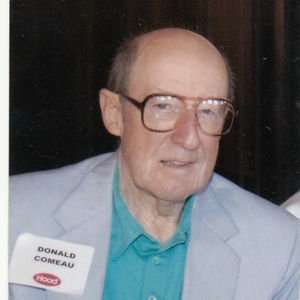 Donald A. Comeau passed away at Melrose-Wakefield Hospital on April 7, 2019. He was born in East Boston on October 13, 1927 to the late Jeremie & Elizabeth (Mailette) Comeau, raised in Quincy & Somerville and attended Somerville Schools. Mr. Comeau worked at the H.P. Hood Company in the Ice Cream Division for 34 years, retiring in 1986 as a telephone salesman. Donald has been a Melrose resident for the past 46 years and was a longtime member of St. Mary's Church in Melrose. Donald was an avid golfer and enjoyed playing in the senior citizens group at Unicorn Golf Course in Stoneham where he got a hole-in-one. He enjoyed watching old movies, boxing and golf on TV and attending hockey games, wrestling matches and boxing matches. He was an excellent pool player and enjoyed reading: especially technical books. Donald was the beloved husband of 33 years to the late Mary A. (Walsh) Comeau. Caring uncle of Richard Greene & his wife Marie of Everett and Patricia Green of FL. Proud great uncle of Paul Lopilato, Doris DeVincent, Deborah Fitzgerald, Stephen Goodell and Phillip Goodell. Visitation will be held at the Gately Funeral Home, 79 W. Foster St. Melrose, on Wednesday, April 10, 2019 from 8:30-10:00AM, followed by A Mass of Christian Burial at St. Mary's Church, 9 Herbert St. Melrose at 10:30AM. Interment at Puritan Lawn Cemetery in Peabody. Relatives and friends are respectfully invited to attend. Life Stories provides friends and families a forum to post their favorite stories and memories of Donald A. Comeau ensuring the precious experiences are never forgotten. Share joyful times, post a photo that captures the moments you cherish, and allow others to reply, relive and remember.